Adults rest among the foodplant and other low-growing vegetation. Nikon D850, 200mm micro nikkor@ f/11, ISO 200, tripod. 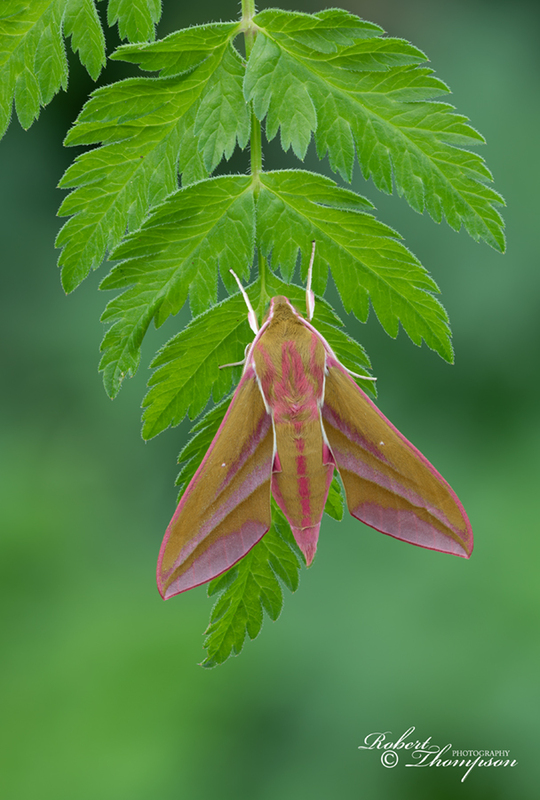 The Elephant Hawk-moth is one of the most attractive medium-sized British Hawk-moths. Adults are pink and olive green in colour and active from dusk onwards feeding on honeysuckle and other tubular flowers. Its name is derived from the shape of the caterpillar which bears a close resemblance to an elephant’s trunk. Adults rest by day among low-growing vegetation and at the base of tree trunks. 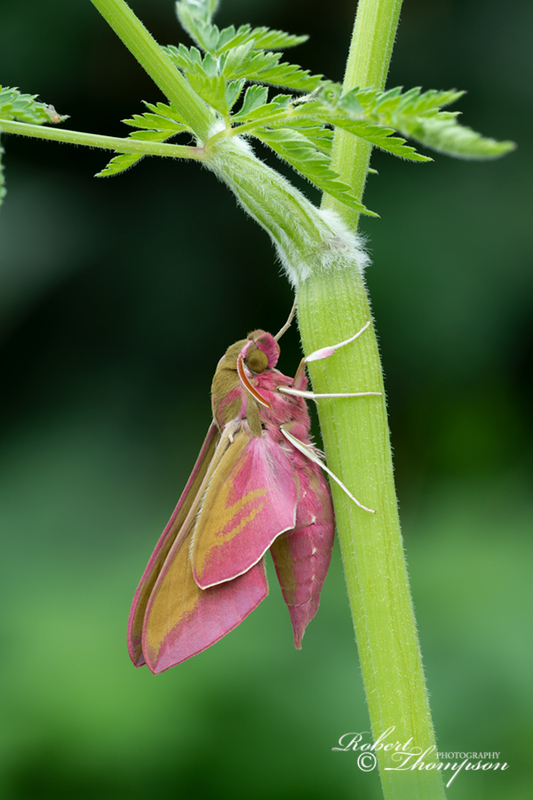 It is similar in appearance to the Small Elephant Hawk-moth Deilephila porcellus, which is smaller but it has a preference for short, grassy habitats especially chalk and limestone in coastal locations. A newly emerged adult resting among the vegetation and completing wing expansion. The moth occurs in a wide variety of habitats including woodland rides and clearings waste ground, heathland and gardens generally preferring mesophilic environments. 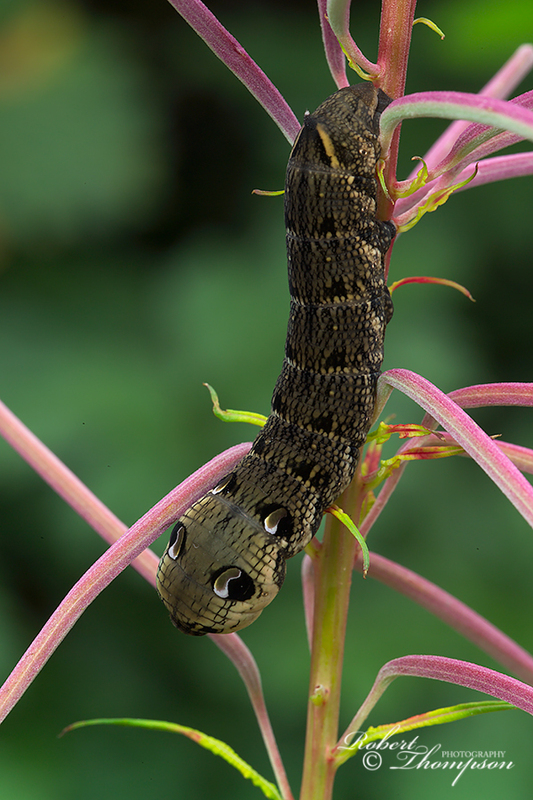 The larvae are oligophagous feeding on a variety of plants especially rosebay willowherb, other species of willowherb including galium and fuchsia. The large caterpillars are impressive and often seen in late summer when looking for a suitable pupation site. I have found them on several occasions in my garden feeding on fuchsia. They have large, conspicuous eyespots and when alarmed, retract its head into its thorax which becomes swollen making them appear larger. They feed mainly at night to avoid detection. 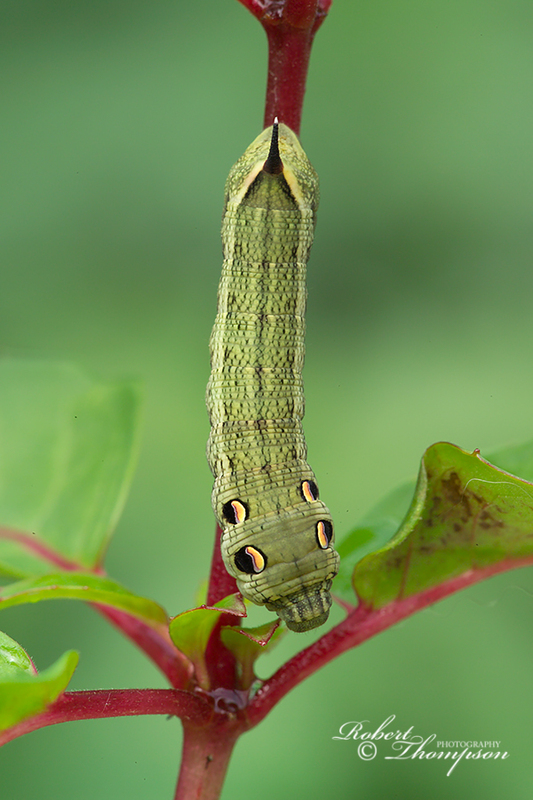 The larvae occur in two colour forms, brown and green; the latter is less common. A fully mature larva brown form on Rosebay Willowherb. Nikon D850, 200mm micro nikkor@ f/8-11, ISO 200, tripod. A mature larva green form on fuchsia. Nikon D2X, 200mm micro nikkor@ f/11, ISO 200, tripod. The pupae are subterranean overwintering below the surface for protection and emerge the following year from May onwards.